If you are a Doris Day fan, one of your dreams is to meet her or even to just be in her presence. And what is so great about Doris is that your dream can come true! All you have to do is to travel to Carmel, CA where Doris lives. 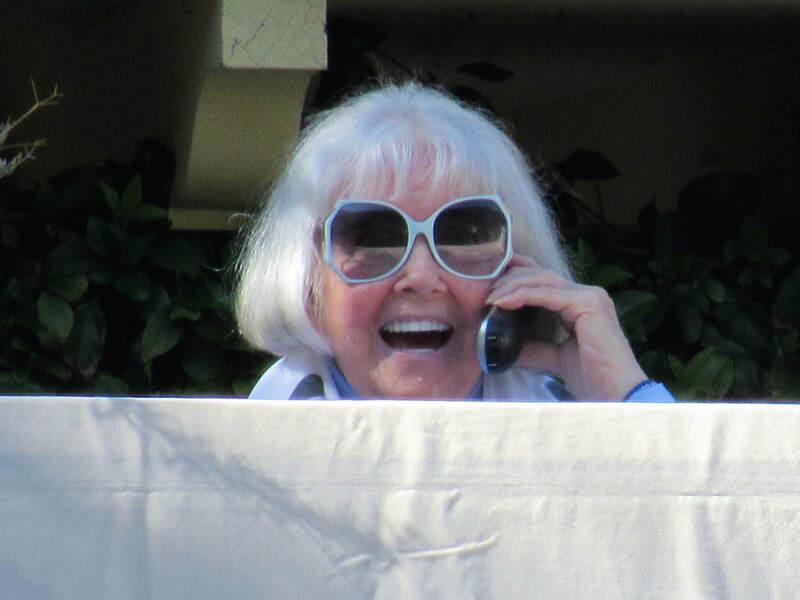 Every year on her birthday, Doris’ fans, known as Dayniacs, travel from all the corners of the world (not just the USA) to the small picturesque village of Carmel-by-the-sea to celebrate her. This year a 3-day celebration had an abundance of fun-filled Doris-loving events either held by the Doris Day Animal Foundation or fan run. The celebration was kicked-off with an evening Doris-themed bingo where the brilliant and lovely Jackie Joseph acted as the MC. This was a fan run event held at the beautiful Cypress Inn living room. Dayniacs are a tight knit group. Some have known each other for years while others may have never actually met in person and only interact online but consider each other good friends despite this. Some Dayniacs are also extremely talented. On the second day of the celebration the wonderful, and award winning, Scott Dreier performed a show of songs and stories based on his recent album ‘The Doris Day Project’. An exceptionally great event all Dayniacs appreciated and enjoyed! Dayniacs also had the chance for chats, photo opportunities and time to greet and mingle before the show during the reception. The main event was held during the final night and it was a great event as it was the 50th Anniversary of the movie ‘With Six You Get Eggroll’! Before the screening, Doris co-stars, Jackie Joseph, John Findlater, Jimmy Bracken, and Bernie Kopell graced the stage and discussed the movie and working with Doris. Philip Brown who played Doris’ son on ‘The Doris Day show’ was also there. After the talk, an auction was held with memorabilia to raise funds for DDAF where Dayniacs generously bid for a good cause and a great prize. I am sure all bidders are happy with their winnings. While that was the end of the formal celebration, fans always find ways to make this great event a once in a life time event!! On Sunday morning while all are gathered at the Cypress Inn discussing how lovely all the events had been and how fun and joyous they were, some of the most dedicated fans I have ever met (whose names will not be made public) worked their magic and announce that we may be able to see Doris! Everyone lights up, discussions on how Doris has influenced everyone’s life are being made. ‘How did you first discover Doris?’, ‘What was the very first song you ever heard of her?’, ‘How many times have you done the Carmel pilgrimage?’ etc. Not long after, we get the go ahead!!! Doris is willing to indulge us!! Dayniacs with cars offer a ride to those without. Smiles and happiness in anticipation is in the air! Just a short drive along the serene Carmel Valley and we will reach our destination. During this drive I understood why Doris decided to reside here. It really is a beautiful area combining idyllic beaches and peaceful woodlands. Our destination was a golf course to which Doris house overlooks! I’ll be honest, the first thing that impressed me was the quality of the grass…it felt edible! It was that good!! Once all dayniacs made their way to the entrance of the club, the two fans that led this adventure gathered us all, gave us some tips from IT issues to the very understandable not talking about losing a beloved pet because it makes Doris really sad. IT checks were done, and everything was in good order. Because we were a good bunch of about 50 people (my crude estimation) it was understandable that we would not all be able to talk to Doris. To keep everything fair a lucky draw was made. Ten lucky people were going to speak to Doris! There was a lovely mother and daughter in the crowd that you could tell they loved each other very much and they both loved Doris very much too! The daughter was also the youngest fan in the group, I think she was 12. A kind lady, designated her raffle number to Wendy, the little girl, and luck had it that it was drawn! Wendy cried tears of joy, graciously thanked the kind lady and hugged her mom. You could tell the mom was very proud and excited her daughter would speak to Doris! But luck struck again for that family! On another draw, it was Wendy’s number! She said she would like her mom to have her number and they both cried tears of joy and hugged! It was the most heartfelt thing to watch. How beautiful that the love for Doris transcends age and generations and both mother and daughter felt the same love, pride and joy over speaking to Doris! Ten extremely happy people and 50 overall excited dayniacs. The time arrived. A couple of golf carts led the way, and we walked through the golf course to get to a premium spot where we could see Doris and can be seen by her. We reached directly under her balcony. Within minutes Doris appeared. She waved and sat down. I separated from the crowd and stepped a bit further back in order to snap some photographs, so I didn’t get to hear the questions of all fans. But even though I do not have any Q&A to include in this piece what I can tell you is that I could not hear the questions of the fans but I could hear Doris’ answers crystal clear!!! The lungs in that woman!!!! Why does she not still sing is beyond me! She wasn’t screaming, she was merely talking to the phone but the acoustics of the height of her balcony and her gifted vocal cords was all that was needed for sound to travel to my ears. And what a sound! When you hear her voice chills go down your spin!! I felt that before with her records but hearing her actual voice….it’s a completely different experience! And the woman was only talking!!! I can only imagine what an experience it would be to listen to her sing live! After all fans asked her their questions, which she graciously answered all, we all sang happy birthday or was the singing before the talks? I don’t recall and it doesn’t really matter! What matters was that Doris was in great spirits ‘conducting’ our singing! We told her we loved her and waved her good bye. She waved and sent kisses. Nobody wanted to leave, she was still at her balcony, did not move despite us departing. While walking away, we waved, and she waved back. I was told, Doris never leaves first, she will wait until each and every one of us has gone and has kissed and waved us away before going back into the house.